From time to time, we are asked by other organizations to help them with one of their projects. We do not fund projects for other organizations and we do not maintain their gardens or public areas. Gonzales Memorial Hospital Atrium. Our members worked with hospital staff to design a new atrium garden and to convert and existing sprinkler system to drip irrigation. Norma’s House. Our members worked with the staff of Norma’s House to develop a landscaping plan that they could use to raise funds to improve their facility to better meet the needs of their clients. 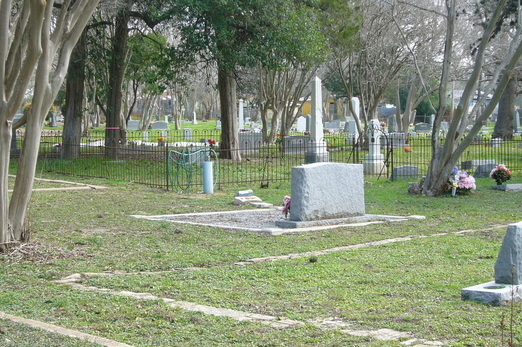 Gonzales Cemetery. Our members worked with other community groups and the City of Gonzales to clean up and clear out the overgrown vegetation at the historic Gonzales Cemetery. Butterfly Garden. Our members worked with other community volunteers to install drip irrigation and plant the Butterfly Garden in downtown Gonzales. WIC Teaching Garden. Our members worked with Gonzales Women's Center WIC staff to design and build a teaching garden for the Center's Nutritionist to use as a teaching garden to demonstrate opportunities to grow healthy foods using a variety of garden designs and vegetable plants.